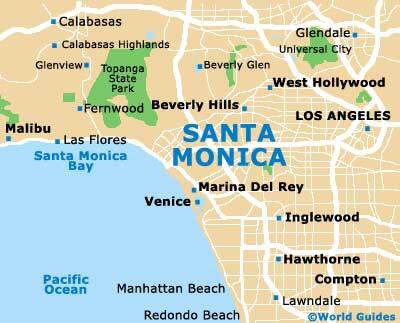 Santa Monica is home to a Mediterranean climate, with over 300 days of sunshine a year, making Santa Monica a popular holiday destination. The summer months in Santa Monica, from June to September, feature typically hot, sunny weather, and cool evening breezes, when temperatures drop. Summer weather in Santa Monica peaks at around 29°C / 84°F during July and August, with many fine days. Rainfall is light in the Santa Monica area and is spread throughout the year, although slightly more rain falls during January and February, often quickly followed by sunshine. 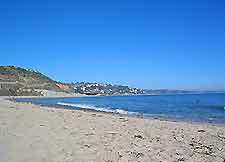 The average annual precipitation / rainfall in Santa Monica is around 12 inches / 33 cm. Santa Monica's winter weather and climate is generally mild, and December and January are usually the coldest months of the year, when temperatures range from highs of 20°C / 68°F to lows of 9°C / 48°F.